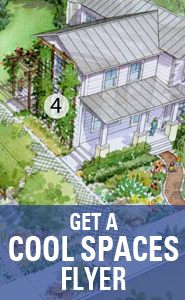 Learn about six ways that homeowners, architects and homebuilders can help keep Austin cool. Austin summers are hot, and getting hotter. Especially in summer, that extra heat can be a serious problem for our health, our environment, our energy and water consumption, and other aspects that effect our quality of life. Check out the Earth-Wise Guide to Cool Spaces, and the City of Austin's Green Roofs webpage for additional resources. Temperatures get hotter in the city than in rural areas, because the built environment (highways, buildings, parking lots, etc.) absorbs and retains far more heat than materials in the natural environment. As Austin becomes more built up, this “heat island effect” intensifies. Not only does the whole urban core gets hotter, but specific hot spots – like an expanse of blacktop parking lot – can become intolerable. The heat island effect adds another layer to the temperature increases caused by climate change and associated drought. Local modeling shows that climate change alone could raise our average summer temperatures in Central Texas by several degrees, by mid-century. The hotter it gets, the more people increase their energy use to cool buildings – which only increases greenhouse gas emissions. It’s a cycle we need to break. Read more about heat island risks. Fortunately, Austinites can help mitigate the heat island effect by making informed choices when designing, constructing or remodeling a home or other building. Please help Austin reduce the heat-island effect, by adopting these six strategies. Go green and lighten up! Click on each of the six thumbnails below for a flyer with information on that strategy.